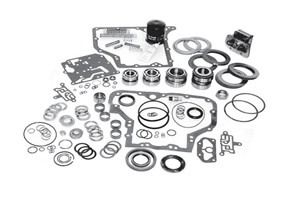 Engine Fix UK personnel have unsurpassed industry knowledge of designing, developing manufacturing and distributing OEM quality replacement Engine Lubrication Oil Pumps, Engine Cooling Water Pumps and Fuel Lift Pumps. 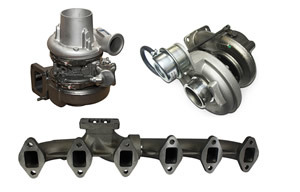 We can offer a wide and comprehensive range of parts covering Light and Heavy Commercial Vehicles including Trucks and Buses, Off Highway Construction and General Industrial including Power Generation and Material handling and also Agricultural applications. 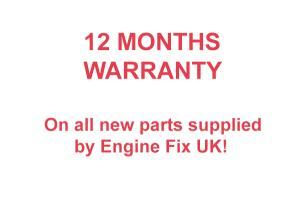 All pumps are supplied with the necessary Gaskets and O rings and fitting instructions for installation of the pump onto the engine. Our products are designed and manufactured to match and in some cases surpass the OEM flow and pressure requirements, ensuring that the pump yields the correct flow characteristics and operating pressures throughout the engine operating range. All our products undergo 100% testing to ensure that we give to our customers’ optimum product performance ensuring our products provide the necessary reliability, durability and longevity of operation for the engine. The lubrication oil pump range we offer lubricate, cool and fuel the world finest diesel engines from 1.5 to 30 litres capacity. We also specialise in supply of higher pressure charge pumps used in industrial transmission. All the products we provide have been designed and developed by our engineering department who use 3D Solid Edge CADCAM software, we also conduct considerable bench testing both performance and durability to ensure that our products will exhibit the required performance, reliability and durability when fitted to the engine and vehicle application. The pump in an engine circulates engine oil under pressure to the rotating bearings, the sliding pistons and the camshaft of the engine. This lubricates the bearings allowing the use of higher-capacity bearings and also assists in the cooling of the engine. 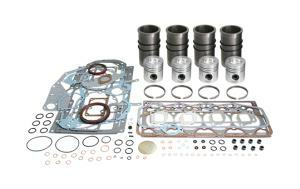 The Oil Pump is generally always mounted low – down, either submerged or around the level of the oil in the sump. A short pick-up pipe with a simple wire mesh strainer reaches to the bottom of the sump. Failing to properly lubricate the engine will result in engine failure, oil flow through the oil filter and sometimes an oil cooler before going through the engine’s oil passages and being dispersed to lubricate pistons, rings, springs, valve stems and more. In general terms the oil pressure generated should be between 55 to 80 psi, local pressure (at the crankshaft journal and bearing) is far higher and set by the pump’s internal or external relief valve. All engines are ‘open systems’ because the oil returns to the oil sump by a series of controlled leaks, excessive bearing clearance increase the pressure loss between the first and last bearing on the crankshaft. To ensure that the oil pressure does not exceed the rated maximum particularly on cold start up once pressure exceeds a preset limit a spring loaded pressure relief valve dumps excess flow /pressure to the suction side of the pump if the relief valve is internal recirculation or directly back to the sump if the relief valve is of external recirculation design. Low Oil pressure can cause engine damage, the low oil pressure can be caused by a faulty pump, such as a clogged oil pick up pipe, excessive wear on the pump due to high mileage, faulty relief valve which is stuck open. 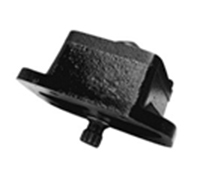 Disadvantages of dry sumps are increased weight, additional parts, and more chances for leaks and problems to occur. The gerotor is a positive displacement pumping unit consisting of just two elements: an inner rotor and an outer rotor or annulus. The outer rotor/annulus has one more tooth than the inner rotor and has its centerline positioned at a fixed eccentricity from the centerline of the inner rotor and shaft. A Gerotors sets come in a variety of geometric configurations, materials and sizes, all gerotor pumping sets have conjugately generated tooth profiles which provide continuous fluid-tight sealing during operation. As the gerotors rotate about their respective axes, fluid is drawn into the enlarging chamber to a maximum volume. 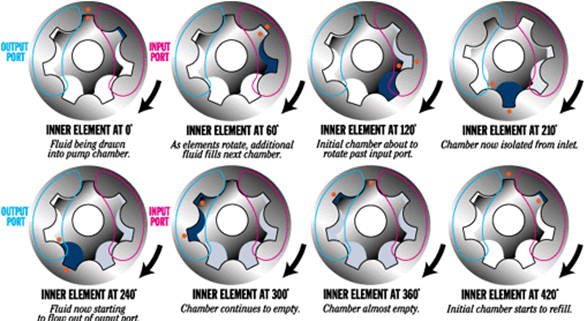 As rotation continues, chamber volume decreases, forcing fluid out of the chamber. The process occurs constantly for each chamber, providing a smooth pumping action. The advantage of use of a gerotor set lies in its simplicity, versatility and performance. A gerotor pump requires minimal amount of machining and a small number of components to form the complete pump. The prime advantage of the gerotor set is that it can be produced a powdered metal sintered part which has the required accuracy and material properties such that machining of the pumping elements are minimal and no subsequent heat treatment of the gerotor is required. 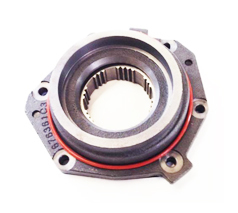 For example, there are no expensive crescents to machine into the pump pocket, and compared to co-axial spur gear pumps, the gerotor design can eliminate a shaft and two bearings. A gerotor pump can be used in most applications where a co–axial gear or crescent pump operates up to approximately 300 psi. The versatility of the gerotor may be its greatest advantage. 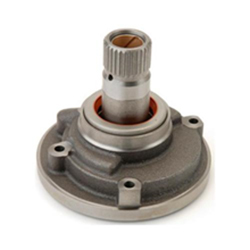 Gerotors can be mounted directly on an existing shaft or can be driven via the outer rotor. A gerotor’s size and geometry can be optimized for performance. The outside diameter, inside diameter, and length can be adjusted to create the smallest possible overall size, saving weight and minimizing power loss. Gerotors have a long service life because the relative velocity between the inner and outer element is very low. 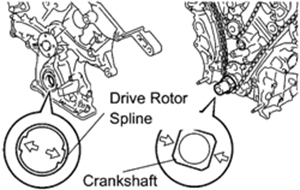 For example, when a gerotor assembly consisting of an 8-tooth inner rotor and a 9-tooth outer rotor is operating at 1800 rpm, the relative speed between the inner and outer rotors is only 200 rpm so wear will be minimal if oil condition is kept optimum by oil and filter changes to the recommended service intervals. To match the oil pump to the engine, we need to determine the flow and pressure requirement for the engine. To determine minimum pump flow, the worst case is typically a combination of low speed, high pressure and high temperature so the pump flow is normally specified at engine idle speed on hot oil, at higher engine speeds there is normally a pressure relief valve which modulates the oil pressure at higher engine speeds such as rated speed, the relief valve opens and recirculates oil either internally within the pump or externally back to the sump of the engine. Once the flow at a given speed has been determined, the gerotor's theoretical displacement can be calculated making assumptions of the volumetric efficiency which can be as high as 95% at normal engine operating pressures of 60 psi but for higher pressures of 300 psi the volumetric efficiency can reduce to 70%. 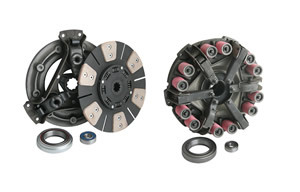 Ability to accommodate greater shaft diameter such as engine crankshafts. In the case of option drive option 1) the drive ratio of the gear can be used to optimise pump speed, the location of the pump centre-line height is normally set as low as possible in the engine to keep the prime height of the pump to a minimum, this will lead to the pump being better able to prime the oilways when the engine is cranked over prior to start up, often the optimum solution in this case is that the pump is mounted on the underside of the engine cylinder block and the pump sits within the sump pan making the prime a matter of inches. The pump shown below is an example of a gerotor pump which fits on the engine cylinder block front cover and fits within the engine sump pan, the example shown is fitted in the Ford Cargo Truck engine. In the case of drive option 2) the oil pump is situated normally mid-engine at the bottom of the cylinder block but with an extended drive shaft with splines/hexagons that mates with a secondary drive a skew gear with mates with the gear on the camshaft, with this design the pump speed runs at half engine speed so the power losses are normally lower. Again as in option 1) the pumping chamber of the pump sits in the sump so the inlet and outlet pipework are simplified and again the prime height is kept to a minimum. 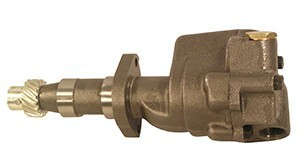 The oil pump shown below is an example of an oil pump driven off the camshaft, the pump shown if fitted to Ford Dorset and Dover engines. In the case of option 3) the oil pump is directly driven off the crankshaft therefore due to the inherent size of the crankshaft the inner gerotor has to accommodate a large shaft diameter so the gerotor will normally have a larger number of teeth and the outer gerotor will be larger in diameter. However, the crankshaft in a diesel engine is normally subject to both torsional and axial activity so this generally means that the choice of the gerotor materials needs to stipulate harder materials by either specifying higher density sintered materials or using supplementary heat treatments to produce a harder more durable material. However, this design solution is generally not used on larger diesel engines as they are torsionally more active and the need for higher flow means that space at the front of the engine becomes a constraint. The advantages of this system is that you reduce the number of gears in the engine drive train and the prime height again is minimal. The pump shown above is an example of an oil pump driven directly off the crankshaft, this pump is fitted to an International 466 engine. 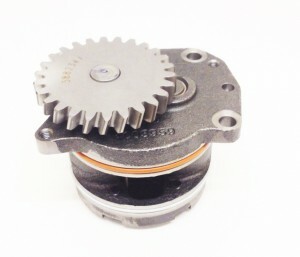 For Larger capacity diesel engines, the gerotor set principle has its limitation with regard to its flow capacity within the dimensional constraints, also the larger engines have higher loadings and as a consequence the better pumping principle to adopt is a co-axial gear type arrangement which enables the use of hardened gears with greater flow capacity and uplifted durability capability, generally these pumps have more components within and are therefore more expensive to manufacture. The pump generally consists of two meshed spur gears or helical gears enclosed in a housing. 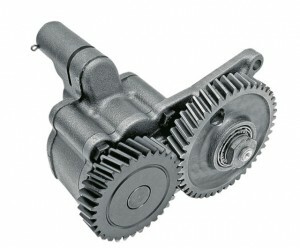 There is very little clearance between the gear teeth and the housing. One gear is attached to a shaft which is driven through suitable gears from the camshaft or the crankshaft of the engine. The other gear (Idler Gear) is free to rotate on its own bearings. 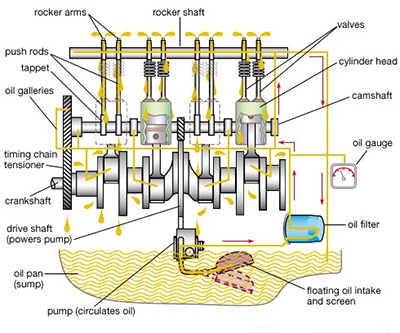 When the pump is in action, the oil is driven between the gear teeth from the inlet side, carried around the between the gears and the pump housing and forced out of the outlet side. The quantity of oil supplied by the pump depends on the size of gears and the speed of rotation of the gears. The pump shown above is an example of a co-axial gear pump driven by a skew gear directly off the camshaft in this case on a Fordson Major engine. The pumps shown below are examples of a Detroit oil pumps that bolts up to the base of the cylinder block and sits in the engine sump pan and a Cummins pump which is driven higher up the engine from within the engine gear train. 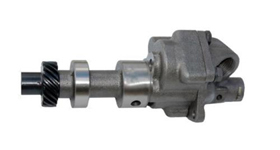 Engine Fix UK manufacture a range of transmission oil pumps which fit in Industrial Off Highway Transmissions, these charge pumps actuate the transmission and as a consequence are required to work at higher operating pressures. Typically a engine oil pump will operate at 80-100 psi whereas a transmission pump will operate at 200-400 psi. To generate these higher pressures the pumps generally are of higher tooth gerotor set or a crescent type principle. 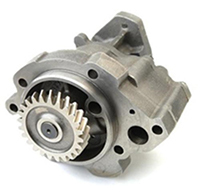 In most cases the oil pump is situated close to the torque converter although in some cases the pump can be independently driven higher up the transmission. The higher pressure requires greater precision of the pumping members and generally the running clearances are minimal. The use of a high number of gear teeth means that the pressure ripple is kept to a minimum to ensure there is no hydraulic noise developed in the transmission. Shown to the left is a simple schematic of how a crescent pump works. Liquid enters the inlet port between the rotor (large exterior gear) and idler (small interior gear) teeth, the arrow indicate the direction of the pump and the oil within it. 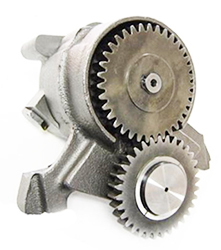 The oil travels through the pump between the teeth of the “gear-within-a gear” principle. The crescent shape divides the oil and acts as a seal between the inlet and outlet ports. Intermeshing gears of the idler and rotor form locked pockets for the oil which assures high volumetric efficiency. 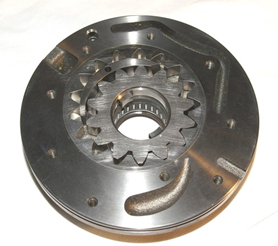 The rotor and idler teeth mesh completely to form a seal equidistant form the outlet and inlet ports. This seal forces the oil out of the outlet port. 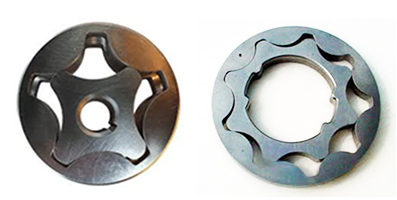 The photo graph below shows the typical internal machining characteristics of a crescent pump used in industrial transmissions.